It was a long time ago that Paul Harris was born – 19th April 1868. Thank you Paul and Happy birthday even today. He would be very pleased at the birthday presents we would be celebrating with him in District 9800 Clubs. Some of his gifts I was so happy to enjoy. Shine On….when people are dealt rough circumstances they rise above it and shout “I’m going to be the best self I can be”. We celebrate that together and recognize them. The Rotary Club of Hoppers Crossing led by Victorian representative Louise Bugeja, congratulations on hosting a magnificent event. 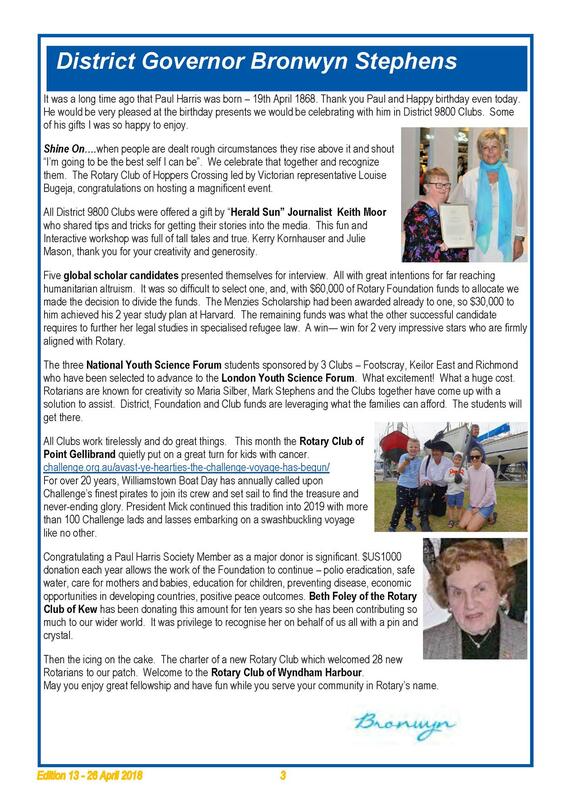 All District 9800 Clubs were offered a gift by “Herald Sun” Journalist Keith Moor who shared tips and tricks for getting their stories into the media. This fun and Interactive workshop was full of tall tales and true. Kerry Kornhauser and Julie Mason, thank you for your creativity and generosity.